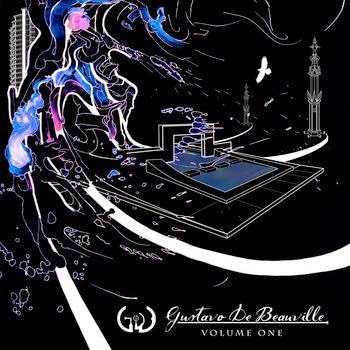 New Prog Releases: Gustavo De Beauville Volume 1"
Gustavo De Beauville Volume 1"
Volume 1 displays in my player as a Soundtrack and in some ways that’s most appropriate in trying to categorize these 15 instrumental compositions most of which fall into the four-minute range. The guitar is the lead instrument of choice but the musical tone isn’t overly heavy. Instead I would describe it as intense and moody with powerful drumming and industrial techno electronics providing a great counterpoint to the guitar work. There is grittiness to the guitar that’s for sure, but it also pulls back from the crunch, displaying other fuzz distortions over the full fifty-seven minutes of the CD. Each tune offers up a core theme or melody that the guitar will play around inserting a solo here or a musical deviation there. Typically a song will start off in one direction, shift into a dramatic change or mood, play there for a while before either going back to the opening theme or creating a distinctly new closing. Still talking about the guitar, it offers up many different sound styles injecting a wide degree of tonal variety meaning the music on Volume 1 is never boring and hardly ever samey, all the while being full of catchy hooks and an overall driving approach. Jupiter's Eye "Tales Calculated To Drive You Mad"
Salander "Crash Course For Dessert"
Akb'al "Of Darkness And Light"
Space Spectrum "The Red Eyed Queen"
Yochk'o Seffer "Acel III - Lyrikus-Szozat"
Above This Burning Sky "Somnium Bellum"
Amoral "Fallen Leaves and Dead Sparrows"
Cynic "Kindly Bent To Free Us"
Colin Edwin and Lorenzo Feliciati "Twinscapes"
Appearance of Nothing "A New Beginning"
Misty Ways "Train of Lust"
Aeon's Fall "Echoes of Remembrance"
Mind Portal "1/2: Thought and Matter"
Jeff Green Project "Elder Creek"
The Return South "The Return South"
The Experiment No. Q "The Experiment No. Q"
A Sense of Gravity "Travial"
Electric Litany "Enduring Days You Will Overcome"
Phase Shift "Lack of Silence"
Midwich Youth Club "From The City To The Country"
Spoke of Shadows "Spoke of Shadows"
Not Otherwise Specified "Projective Instruments"
The Kindred "Life in Lucidity"
Seasons of Time "Closed Doors to Open Plains"
But a Thought "...But A Thought"
Mark Bogert "A Story In Parts"